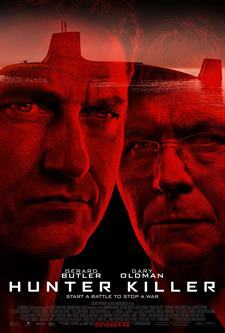 Download Hunter Killer in Digital HD from the iTunes store. Listen to the Hunter Killer soundtrack on Apple Music. Hunter Killer images are © Lionsgate. All Rights Reserved. I've been ‘jonesing' for a good Action/Adventure film for some time now. It's been quite a while since a really good one has graced the screen. I like getting involved in the film's action, quietly cheering on the hero, watching the complex story unfold, realizing the impossibility of overcoming the situation, and then seeing a slam-bam over the top conclusion. How could you not love that kind of movie?!! Yet, they no longer make many of them. So along comes "Hunter Killer" (the name of an advanced class of American attack submarine), a geopolitical thriller complete with action hero Gerard Butler, proverbial semi-bad guy Gary Oldman, a batch of unstoppable navy seals, and a hand full of rogue Russians. Be still my heart! I grabbed my popcorn, sipped my coke, and snuggled into my seat to watch the action, hoping the film would be outrageously entertaining. And guess what, despite its clichéd, generic, self-important story, it pulled off some real moments of suspense and turned out to be a great two hours of watchable escapist fun. An American submarine is suddenly lost deep beneath the Arctic Ocean. The Pentagon is in a frenzy because all that is known is that our sub has disappeared, and may possibly have been sunk. Newly appointed American submarine captain Joe Glass (Butler) is sent into Russian waters by Rear Admiral, John Fisk (Common), to find the sub and seek out what happened. Finding two submarines on the ocean floor next to each other, Glass soon discovers that the American sub was torpedoed, but quickly realizes that the Russian sub was sabotaged from within. Before he can make sense of any of this, let alone breathe, he is under attack. Meanwhile, above the surface, a rogue Russian Defense Minister (Gor), has taken the Russian President (Diachenko) prisoner in a coup attempt that depends on provoking the United States into a war. Now, I'm not saying this film is in a class with such submarine movies as "Das Boot" or "The Hunt For Red October" it's plainly not. It's riddled with every military action movie contrivance you can think of, but so what, they are still fun to watch, and this film uses them so very well. Butler is Butler, ever the maverick hero we love to watch, Oldman is under-used and not quite the brute he usually plays, Common is just miscast, Nyqvist is as stoic as ever, and yet the mix just gels into a very enjoyable film.